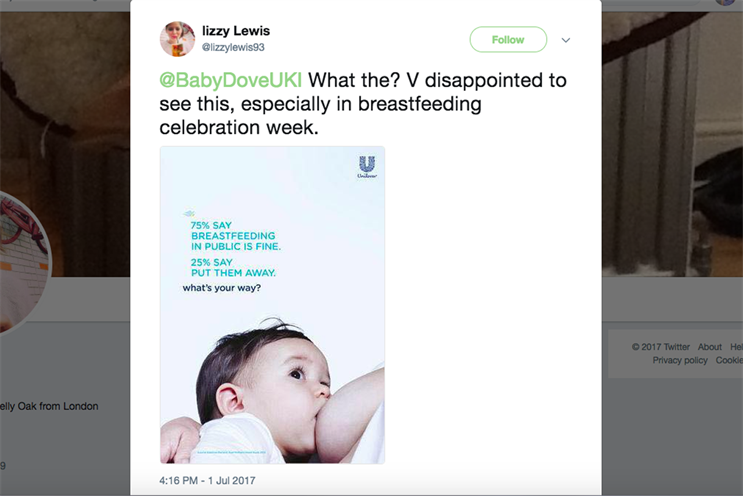 A Baby Dove campaign highlighting different parenting styles has drawn criticism for supporting those who are against breastfeeding in public. The Advertising Standards Authority has confirmed it has received 117 complaints over the wekeend about the campaign. "60% of people are 'passionately against' feeding a hungry baby"
"34% of people are against breastfeeding in public"
The general nature of the complaints, said the ASA spokesman, is that it is unclear where the stats come from, and that the first one encourages a parenting style that complainants feel is poor or neglectful. "The second one perpetuates a negative perception of breastfeeding in public," he said. The ASA is still processing the complaints and no decision has been reached as to whether there are grounds for action, the spokesman added. "We’ll carefully assess the complaints before deciding on next steps." Oddly enough, the brand's own campaign seems to have two different sets of statistics around breastfeeding in public. In the ad above, the stats are instead 75% for and 25% for "put it away". The wave of complaints appear to be led by a blogger @TheUnmumsyMum who pointed out the brand should not support both sides of the coin "every step of the way". The Mumsnet forum too has started a thread criticising the campaign. Unilever has been contacted for comment but has yet to respond. In a statement it issued to the BBC however, the FMCG giant said the campaign "aims to celebrate the different approaches and opinions around parenting". It's unclear which agency is behind this particular social media campaign. Dove's creative agency of record is Ogilvy. This latest move by Baby Dove follows its controversial launch of its babycare range which used an AI algorithm to depict the image of a "perfect mum". The agency leading that particular campaign was PR firm MHP Communications. A Unilever spokeswoman said: "We believe there are many ways to be a great mum or dad. Our campaign simply aims to celebrate the different approaches and opinions around parenting, including whether or not mums choose to breastfeed in public, recognising that it’s ultimately what works for you and your baby that matters the most." This campaign also bears a certain similarity to Heineken's "World's apart" campaign which received criticism for placing ideas like feminism and sexism on an equal playing field.